Swindle is easily one of my favourite Combaticon, by the sheer dint of his personality. And by personality, well, I mean that he’s a greasy salesman who, as his name implies, will swindle you out of all your money, your house, your car and your lunch. The fact that such a slimy character is part of the Decepticons’ apparently most professional and elite squad of military soldiers always brings a smile to my face. Swindle has gotten some nice interpretations after G1, featuring as a Big Bad (surprisingly) in some of the modern IDW comics, and having a minor but very memorable role in Transformers Animated. Swindle is also one of those names Hasbro slaps on random toys. One of my first-ever toys as a more serious collector is a Swindle, which is cool, but it’s not the greasy businessman Swindle. In Fall of Cybertron, Swindle's got a whole new level to himself, where he uncharacteristically is an actually competent soldier that zips around with a grapple to sabotage an Autobot transport. It's completely OOC for him and it's kind of ridiculous to pick Swindle of all people for this level, but oh well. With Vortex, he is one of the two most prolific Combaticons in the game. Of course, I will still forever remember him as the greasy business-salesman thing. 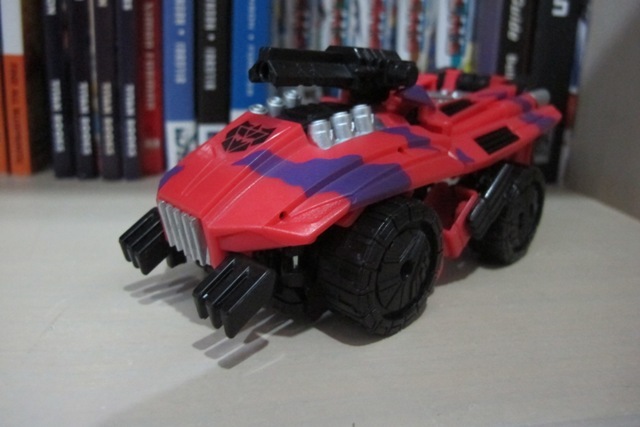 Swindle’s a military jeep in the original design, and when he was reimagined as part of the Fall of Cybertron aesthetic he retains a jeep-like alternate mode. 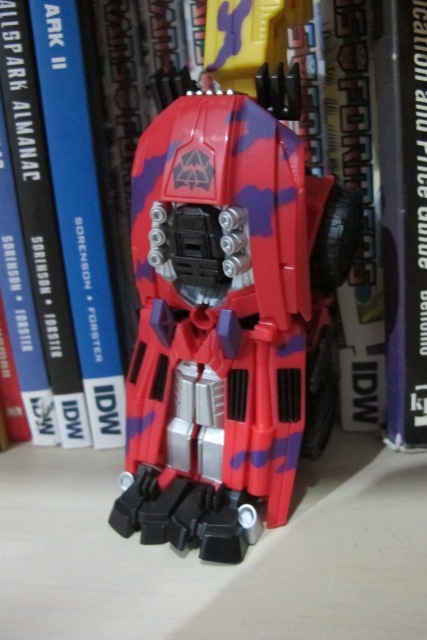 It’s pretty decent, fairly bricky, and resembles a jeep (or an all-terrain-vehicle), albeit one that came from Cybertron. 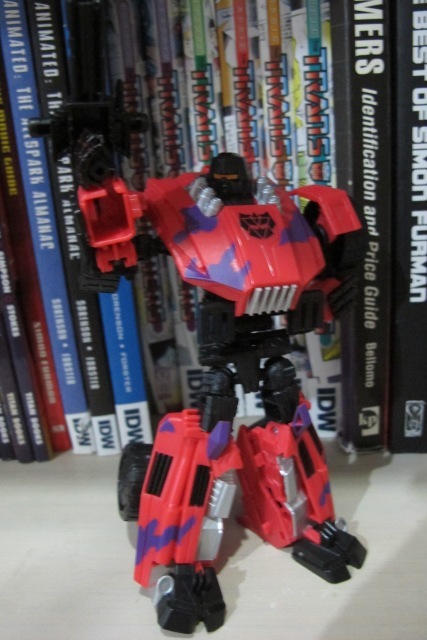 In the game Swindle’s four giant wheels can split apart and form eight hover-wheels when he’s idling, but this is absent in the toy, obviously. Swindle’s fairly detailed without being over-cluttered like Blast Off. He’s got some kind of mine-clearing things in the front, he’s got pistons and what looks like a hot-rod engine, he’s got slanted exhaust tubes on the sides… which basically makes him a hot rod jeep, I suppose? Regardless, I quite like his alternate mode. Swindle’s coloured mainly a nice, pleasing rather downtoned shade of red, with purple splotches as usual. He’s got lots of black, from the giant wheels, to the robot head center of the hot rod engine ensemble, to the mine-sweepers to some random details on the back. He’s got silver as part of his grille, his hot rod engine piston thingies, and again some parts of his back where I assume he hoards his goods. It’s a bit of a shame that out of the two long exhaust tubes that run through his sides, only the end is coloured silver. In the SDCC and retail versions of Swindle (more on various versions in the full Bruticus review) the entire pipe is painted… but oh well. I’m also not sure how I feel about the wheels being entirely black despite having loads of detailing molded into it. There’s a fair bit of robot kibble, like the knee-spikes and the rear of his robot head, but these are pretty nicely disguised as part of his alternate mode. There are two flat chunks of plastic near the rear wheels that are obviously to stabilize Bruticus if Swindle becomes a leg, which annoys me a little, but not that much. The alternate mode is not a perfect copy of the game model, but unlike Onslaught or Blast Off, it isn’t that far off either, with the liberties they take being forgivable for the most part. Overall, though, I quite like Swindle. He can roll around pretty well, and you can attach the chunky gun he came with on his center. I really like how Swindle looks in robot mode, how he looks very cohesive and… I can’t put my fingers on it. I just like Swindle’s robot mode. Keep in mind that Swindle’s mistransformed in most pictures of him. His shoulders are usually transformed horizontally. Combined with the downward slope of the chest, it gives him a very slumping look. His shoulders are actually jointed to be able to angle upwards, which vastly improves Swindle’s proportions and looks in general. The giant wheels on his shoulders give him a rather imposing look. His transformation, while simple, has quite a bit going on for him as well. There are pegs where the hood and the minesweeper things peg onto, making his robot mode very stable. He looks a bit brackish, but he’s actually pretty well-articulated. His head turns, his shoulders and ebows are on ball joints, he’s got a hip joint, thigh joints, knee joints and ankle joints. Basically the standard fare for a Deluxe class… something none of the other Combaticons (bar Vortex, but he’s got his own problems) have. Some of his kibble are even articulated, namely the shoulder guard things can rotate upwards to make him look more imposing or downwards to possibly protect the shoulder joint. The wrist-exhaust things, similar to Hot Rod, can rotate outwards to resemble wrist cannons or backwards in ‘storage’. He’s pretty stable due to the large feet, and he can assume most poses easily. He’s got more black in robot mode, and has an orange visor. He’s pretty tidy here as well, and quite pleasing if you don’t mind the eggplant purple camo splotches. 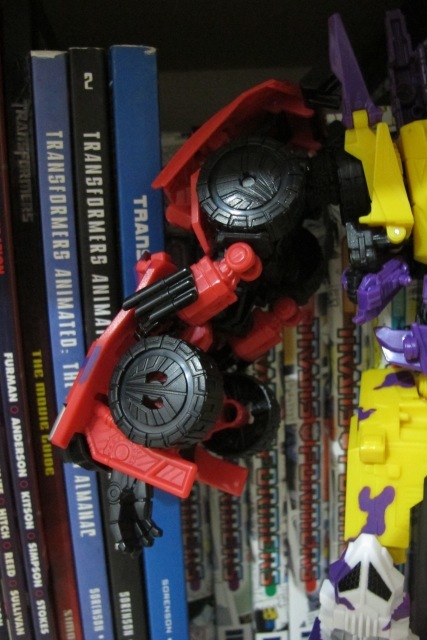 Swindle comes with a chunky little gun that he can hold in addition to the wrist guns. He is slightly bricky, but I’d argue he’s the best out of all five Combaticon robots, due to the fact that his robot mode has a free range of articulation (unlike Blast Off or Onslaught), doesn’t have huge chunks of kibble in the way (unlike Vortex, Brawl or Onslaught) and looks game-accurate (unlike Onslaught). It’s a shame that his game look has a slightly bucket-shaped Megatron-esque head instead of the iconic square head that G1 Swindle has, though, which is probably my biggest complaint about him. He’s also quite taller than most of the other Combaticons. Putting him next to Brawl (the shortest in robot mode) he’s a full head taller. Overall, Swindle is solid in robot mode in all meanings of the word. Swindle nominally forms one of Bruticus’ feet, and the transformation is pretty simple, although it’s not quite ‘stand Swindle up on one end’. There is some fiddling to get the hood part at the right angle to pull out the connector port, and he forms a very stable leg. There are perks to being a brick, eh? Swindle also makes a great arm. He’s got the best-sculpted hands out of any Combaticon limb. Just look at them. They’re gorgeous whether they’re holding a weapon or not. Having two differently sculpted hands instead of random thumb-switching helps a lot as well. If Hasbro’s stock photographs for Ruination are anything to go by, apparently arm-mode Swindle is supposed to extend out to give him an additional elbow joint, but it looks wonky and terrible, plus the vehicle hood kind of flops around aimlessly. I recommend just plugging him in straight-off as a vehicle, maybe extend him a teensy bit so he doesn’t look too short. Anyway, by dint of being a brick and having great sculpted hands, Swindle wins the ‘best leg’ and ‘best arm’ categories. Transformation Design: 8/10 He’s a brick. His transformation is simple yet satisfactory, but not so simple as to skip parts which would compromise him. Both his robot and vehicle modes are stable, and as limbs he works well too. Durability: 8/10 Like his G1 toy, Swindle is a brick and handles like one. Apparently the tabs connecting his leg halves are prone to breaking, though mine still work fine. 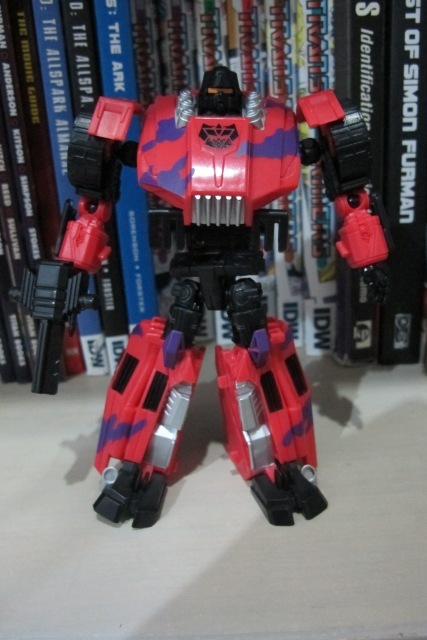 Aesthetics: 7/10 I guess I like his appearance… his G2 colours in particular are pretty striking. Articulation: 6/10 Despite his appearance, he’s got as much articulation points as the average deluxe class toy. It’s something that surprisesme. Fun: 6/10 Swindle’s pretty fun to fiddle around with, I suppose, although I actually think I like mucking around with Vortex more. Value/Price: 6/10 Probably the only Combaticon toy that’s worth the asking price for a deluxe class toy. Overall: 7/10 There is a reason combiners work best in G1… everyone is a brick. Swindle is a brick, but with added articulation. I wish the other Combaticons were more like Swindle. He’s easily the best out of the five. Of course, as a standalone toy he still leaves much to be desired, since he’s really quite simple and a lot of liberties are taken for combination.